Drills pilot holes for screws. Fast spacing for drilling 5mm shelf pin holes. Trim edgebanding quickly and easily. High quality adhesive for veneers and laminates. Provides support, brace, or clamp for whenever you might need an extra hand. Extend the length of your 3rd Hand. Reach up to 22 feet in height. Easily create in and out access through any dust barrier wall. Install upper cabinets when the base cabinets are installed. Install upper cabinets when the base cabinets are not in. A hands-free, self-closing door that you can use over and over again. Convenient 3rd Hand HD pack for contractors. Designed to support upper cabinets after the base cabinets have been installed. Keep your work area clean. Our family of professional quality tape measurers. The ultimate desk piece and stress reliever for the artisan in everyone. Square up your table saw blade effortlessly. Create a beautiful ebony pinned look with the Mortise Tool and Artisan Accents. Heavy-duty handle protects the blade, and your pocket. Utility knife with a rubberized grip, blade storage area, and self-locking. Solve the long time problem of misfired 1/4" staples. Simply pull the blade out and it stays in place. flexible tape for measuring curves and flat panels. Put a tape rule right where you need it. Designed to quickly help you find the hypotenuse (square) of anything. Designed to make measuring for timber frame construction easier. Securely hold your shelf in place. This easy to place and remove clip makes installing crown molding much easier. Stop the struggle of hanging crown molding. Spray both sides of the door by hanging the door vertically. Stop straining your back trying to lift heavy stuff. Construct a professional quality deck. Let the Joist Clip do the dangerous work. All-in-one marking tool for door and window reveals. Build your cabinets in no time and with no assistance. Clean up electrical cutouts in the back of cabinets. The ultimate permanent, waterproof marker. Easily identify what screws are in each compartment. Great for holding your notes in place. Give your screws a place to hang out. Easy trigger pump and even flow. Brighten up those dark drawers and cabinets. Eliminates the need for a tape measure and cutting for angled pieces. Best Fence for your DeWalt Stand. Best Fence for your Bosch Stand. Best Fence for your Kapex Stand. Get the awesome flexibility of the Best Fence on your workbench. Get shop level accuracy in the field. Quickly mask nail holes before you fill them. Larger bottles of this incredible adhesive. Carry your 2P-10 at all times. Mix exactly the right tint of 2P-10 filler in seconds. Finally, a glue bottle that will not drip or spill. Fill holes in finished woodwork. Give new life to your clogged tubes of caulking and adhesive. Holds interior non-load bearing walls in place. Protect your doors from your drawers. Mounting bracket for 5-piece shaker style drawer fronts. Fully adjustable drawer slider installer. Engineered with nibs to cut through your material, allowing your screw to be perfectly flush with the surface. For use with metal studs. Easy alignment after installing a level cleat along the wall. Dual sided interference locking grommet. Make sure your Euro door cabinets look their best. The PowerHead Screw in a sleek & tough black oxide coating. Aprons made of durable, rugged ballistic nylon material. Built with shatter-proof wrap-around lenses, rubber nose pieces, adjustable length arms, and reinforced temples. A superior quality filtration system for general purpose non-toxic applications. Excellent fit, superior dexterity and MAX comfort. High performance textured latex gloves. Made of durable, rugged ballistic nylon material. Instantly seals dings on surfboards, SUPs, kayaks and other personal watercraft! Hold your phone tight and shoot. FLEX Backpack is the ultimate pack. Add flexibility to your mount with the iGooseNeck flexible mount. Gives you an extra mount point for a light. Secure loose wires and cables quickly. Create an articulating camera mount on nearly anything. The ultimate video recording accessory. High-performance textured latex gloves: snag, puncture and abrasion resistant. Eliminate guesswork when finding and returning bits. Make organization clean and easy. Make your own desk or workstation. Make a place for everything and keep everything in it's place. Tired of nubs all over your beautiful shrubs and ornamental trees? SKIN gloves are the ultimate glove/hand relationship. We took our ultralight featherweight CatEyes Anti-Fog Safety Glasses and added diopters. Refill red crayon for the FatBoy pencil. Designed to give you predictable and precise cuts with your SafeCut Ruler. The smartest and safest way to cut materials. This assortment kit comes with a ProHold, PowerHead screws, PVC Sample Chain and a small assortment of FastCaps. Quickly adjust any sagging door. Open pesky plastic packages and boxes with ease. Prevents you from making simple math mistakes when measuring. Eliminate chip out and create an exact reference for line up. Capture all your adventures in the highest possible quality. Keep your fingers safely away from the saw blade. A portable, comfortable and nimble adventure companion for your droning adventures. The usual spring clamp with an additional spring that applies a third direction of pressure. Designed for scribing and fastening stile trim to your walls, cabinets and shelving. Hands-free support under the garbage disposal while you install it. Make dangerous cuts safe for your fingers. Unique design works great for cutting Kaizen Foam. Makes the process of leveling anything from a cabinet to a picture frame fast, easy and accurate. Get that flush edge to any cabinet, countertop, or any woodworking project. Great for organizing workplace, inventory, and hardware areas. Get the awesome flexibility of the Best Fence with any saw stand. Full adjustability when installing table tops. Move sheets of granite in tight quarters and narrow hallways with ease. An easy fastener system for panels. Quickest and easiest way to secure any irregularly shaped object for assembly or storage. Get control of those jumbled cords quickly and easily. Make your own custom shims at any size. Add low profile latches to cabinet doors, drawers, and much more. Easily maintain a consistent scribe in those tight and difficult areas. A quick magnetic attachment for easily organizing small object. Mount panels, signs, pictures, and more to any wall. Combines a retainer for safety glasses and removable ear plugs into one piece. A strong, super light workbench engineered like the rib of an airplane wing. Move large & heavy materials around the job or shop by yourself. Easily lock and quickly release your hole saw. These pads will grab your bench and the wood for amazing staying power. The accuracy of the original Best Fence in a small compact design. Accessories for your 3rd Hand HD. The same precision and quality as our Best Fence Bench Mount System but perfect for a small workshop. Quickly identify tools by department or area. Apply to anything you want to stay put. This book teaches you how I applied Lean principals to improve every aspect of the way I travel. Control the depth and straightness of your countersink. Includes all the tools you need to apply edge banding. A great organizational system for any workspace. Find the center of any board in seconds. An accurate drawer front install every time. Fast, hands free installation system for any drawer slide. Hold your panels upright so you can apply Fastedge, SpeedTape, or sand with ease, hands free! Great for getting that flush edge to any cabinet, countertop, or any woodworking project. Great for heavy DSLR cameras or when you need absolute stability. Increase the speed and quality when attaching 5-piece shaker drawer fronts. Accessories for your Best Fence. Safest way to break off and store used breakaway blades. Store and organize efficiently with our Blue Bins. Perfect compliment to the PowerHead Screws for installing cabinets. Keep things where you want them. Quickly remove the curl out of the edgebanding. Quickly and easily create a slot or pocket. Erasable Kaizen Labels fit our Kaizen Boxes. Holds your safety glasses wherever you need them. Precision tool for cabinet refacing. Break the edge on sharp melamine material in just one pass. Keep your router bits organized, sharp and chip free. The most versatile lighting system you will ever own! Carry your tools easily with an assortment of pockets. Make caddies, holders, or anything that ever needs a handle fast and easy. Make all your shop cuts straight and perfect every time. Surface mount the FlipBolt under countertops. Make a place for everything and keep everything in its place with peel & stick Kaizen Arrows. Maximum organization and visual control in your workspace. Easily smooth the bottom of your cut out. High quality flex fit hat. 5mm Layout Drill Bit for precise, chip-free holes at the correct depth every time. Designed for the 32mm European style adjustable shelving. Have your trowel ready to go. Organize your work, office or home space. The easiest way to set your blade height and fence spacing on your table saw. The ultimate grip. The ultimate comfort. Quick and easy way to square and hold panels during assembly. Remove the frustration of accurately marking out the backs of cabinets for electrical outlets. Stop the struggle of plugging accessory cables in the side of your laptop. Heavy duty tools, easy on your pockets. Transform the way you use magnets. A magnetic pad that fits on your wrist or drill. We have drivers and bits to fit your needs. We have screws to fit your woodworking needs. A new method of joining countertops. No more unnecessary interruptions when gardening. Makes you more efficient by removing the need to walk back and forth to turn your vacuum on. The ultimate mounting solution for any accessory. Join lengths of SafeCut Ruler together. Contain dust and leave you with a cleaner work environment. Makes screwing into wood quieter, easier and faster. Prevent your caulking tubes from drying out. 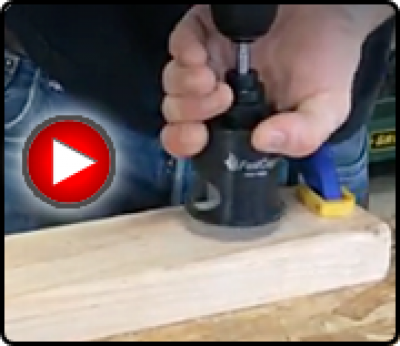 Makes pocket hole joinery even easier. Nifty little tool designed to make using a Sharpie on the job easier and more efficient. Ratcheting system that helps support and install sinks in any countertop. Ergonomic laminate roller for any PSA application. Your peel and stick cover caps and edgebanding "Just in time". The Peel & Stick tape measure puts a tape rule right where you need it. Never wrestle with your vacuum hose or shop vacuum again! Wireless locking system for your box truck. 100% reusable temporary drawer pull and a 1/8” spacer. Keep your tape close at hand. Tiny treads to help hold your stuff in place. Never look or run out of your trash bags again! Reusable construction grade protective cover for stair treads. Get tight into the corners when trimming veneers and edgebanding. The Spade Flush Mount Drill Bit System controls the depth and straightness of your countersink. Simply install your spade bit using the set screws, and use the micro-adjust to fine-tune cutting depth. Wide collar and smooth bearings ensure perfect results on every cut! The Spade Drill Bit will accept spade bits up to 2" wide with a shank up to 3/8" wide. The Spade Drill Bit will accept spade bits up to 2" wide with a shank no larger than 3/8".